Women's Plus Size Pants are a staple in every wardrobe. Whether you need them for work, dress, special occasions or causal wear, here are the different styles and the best Plus Size Women Pants available. are a must have for every plus size wardrobe - we need them for work, church, dinner out and other non-formal special occasions. Black dress pants are surely present in every wardrobe (and probably more than one pair!). We love our black pants because they go with everything and are truly slimming. are standard fare for most business and social settings. 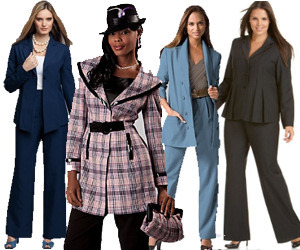 Invest in a good Pants Suit and you can totally change the look by changing the blouse and accessories. have been popular for several seasons and will continue to be in fashion for at least this season and next. Palazzo Pants are wide leg pants that are mostly used for dressier occasions. Like Palazzos, Special Occasion Pants may have layers, slits and are generally wider and more flowing than regular pants. aren't just for Yoga anymore! Yoga pants are stretchy, form fitting and tailored. They look much nicer than most other pants made for exercise and are also great for comfy casual wear. They look much nicer and neater than sweat pants. are pants that end somewhere between the knee and ankle - they are longer than shorts and shorter than full length pants. 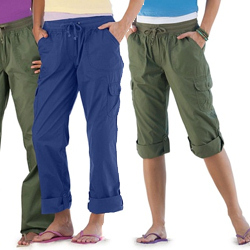 What is the Difference between Capri Pants and Cropped Pants? are a wardrobe staple for many of us, both for lounging and exercising. Traditionally sweat pants are thought of as fleece pants, but there is a large variety of casual pants that are comfortable and suitable for both active wear and lounge wear. are a year round staple for many wardrobes. Khaki Pants are available in a variety of styles. They are acceptable in almost any situation, wether a casual look when jeans won't do, or in many work settings. have been a popular casual wear and blue jeans alternative for several years. are becoming easier and easier to find. Many of the leading online plus size retailers have greatly expanded their selection. 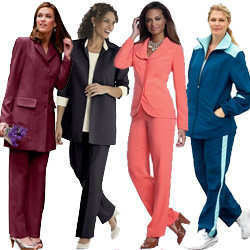 are pants that can be shortened to capri pants or shorts with zip on & off sections or buttons tabs. 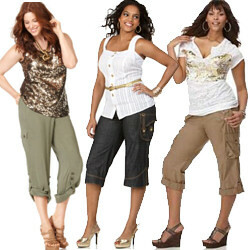 Originally this style was seen in athletic wear, but is being seen more and more in women's casual plus size pants. are a great option if you need to go to a dressier event, a dressy wedding or even for a cruise. There are great options that range from classic styles to those with sequins and glamour. There is an almost endless selection of trendy plus size jeans this season. 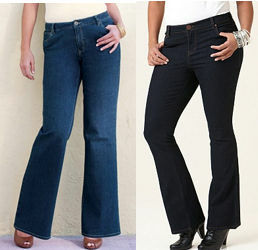 Embellishments on jeans – embroidery or rhinestones – are still very trendy and provide a nice departure from plain jeans.